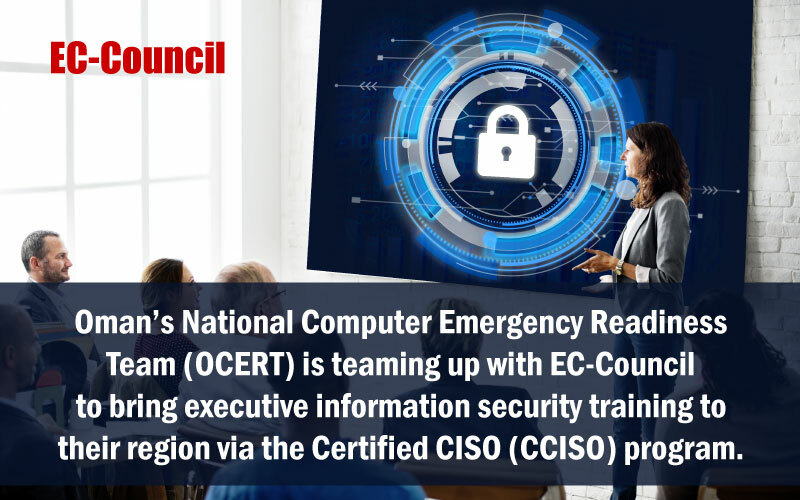 EC-Council > In the News > Press Releases > Oman’s National Computer Emergency Readiness Team (OCERT) is teaming up with EC-Council to bring executive information security training to their region via the Certified CISO (CCISO) program. Oman’s National Computer Emergency Readiness Team (OCERT) is teaming up with EC-Council to bring executive information security training to their region via the Certified CISO (CCISO) program. OCERT’s partnership with EC-Council will be crucial to the organization’s continued success in increasing the security of the government. The CCISO program will bring not just information security training but the actual leadership knowledge needed to improve security outcomes. One of OCERT’s fundamental objectives is to improve the government of Oman’s overall performance in the field of information and cyber security. OCERT will deliver CCISO training sessions for government IT security officers to increase their leadership skills. CCISO training and certification will enable leaders to build IT infrastructure securely, institute process for incident handling, and build risk-based security programs to address vulnerabilities, among many other crucial skills. The CCISO Certification is the industry-leading program teaches the leadership skills needed to succeed at the highest executive levels of information security. The CCISO program combines audit management, governance, IS controls, human capital management, strategic program development, and the financial expertise vital to leading a highly successful information security program. OCERT’s adoption of the program aims to enhance the cyber and information security knowledge of the participants in addition to improving the best practices and know-how to mitigate security risks. This can ensure business continuity and minimize the impact of security risks in the government sector. The target audience for this program will be senior executives from government organizations. OCERT was officially launched in April 2010 to analyze risks and security threats that may be present in cyberspace and communicates this information to users of Internet services and technical information outlets, whether they are public or private institutions, or individuals. This added sense of security will also help to build trust when using government eServices. With the current emphasis on expanding and positioning the Official eGovernment Services Portal as the point of contact using government electronic services, enabling users to feel confident interacting with these services is crucial. EC-Council’s CISO Program has three components: CISO Events, the Certified CISO (C|CISO), and CISO Resources – a repository for white papers, podcasts, webinars and articles geared toward a CISO crowd. EC-Council’s CISO Events are invitation only and geared specifically for high-level, executive information security professionals. Combining keynotes with panel discussions, the events are opportunities for CISOs from around the world to hash out the trends and challenges of information security among their peers. The C|CISO is a certification recognizing an individual’s cumulative experience and expertise in executive information security management. Overseen by a board of seasoned and distinguished professionals, the C|CISO Program has certified over 1,100 IS executives from around the world. For more information about EC-Council’s CISO Program, please visit ciso.eccouncil.org.